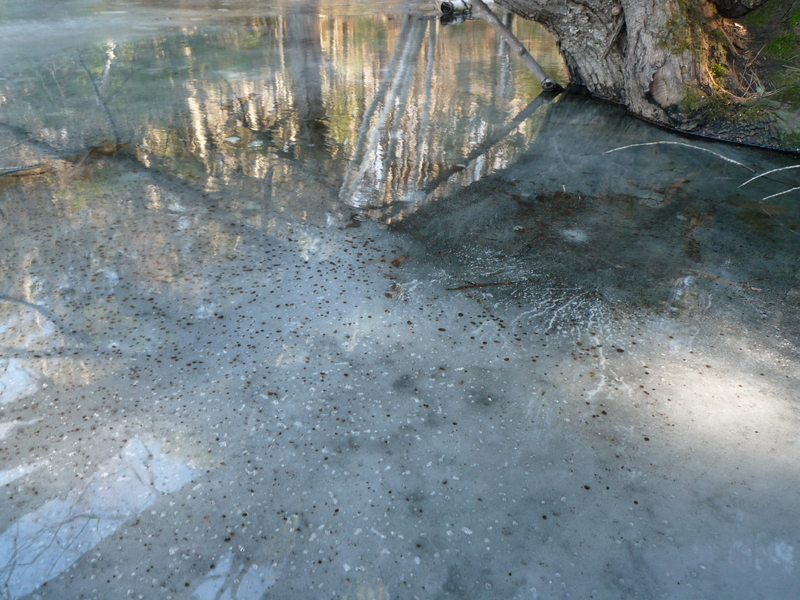 On Monday the ice was pulling away from the shore and the woods were busy with robins. I was feeling a little bit lightheaded, and it wasn’t spring fever. The previous evening, following a delicious Sunday meal, David and I were trying to watch The Tree of Life. It is a fairly trippy film; visually stunning yet contextually perplexing. Soon after the movie started, I developed an intense headache followed by chills and nausea and after an hour had to bail. I popped an anti-emetic, which is supposed to quell nausea (but in fact generally produces the opposite effect for me) and got into bed with a large mixing bowl at my side. Within minutes I vomited. A torrent; more than I thought humanly possible. In fact (confirmed in the a.m. by measuring the capacity of the bowl) , 64 fluid ounces. My husband David (trained as a chemist) offered the mass to volume ratio: five pounds. Gastrointestinal issues are a rather common side effect of treatment and can pose a significant challenge for cancer patients. Obviously, dehydration and depletion of electrolytes can happen rapidly under such circumstances as can loss of calories. Shedding five pounds in a matter of seconds is not optimal. I am a tall person at five feet ten inches and the past few years my fighting weight has been about 145. Every Monday I am weighed, and currently (even prior to the ‘incident’) I tip the scale at about 132. Not too thin, but it doesn’t leave me with much of a ‘cushion’ either. Dosing with an oral targeted therapy is a bit of a blunt instrument, blunter still in the dose escalation phase of a clinical trial, where 700 mg of an experimental agent may be administered to both a small woman and a large man. When I was given infusion chemotherapy (cisplatin/taxotere), the appropriate dose was individually determined by body mass. Such fine tuning is more difficult when the medium is a tablet or capsule rather than a liquid. So, once dose escalation has determined what is safe as well as therapeutic, it is invariably a standardized unit; one size fits all. If patients of disparate size take the same dose, it only follows that potency and the potential for negative side effects might be greater in the smaller individual. On Monday afternoon I had my blood drawn locally and upon returning from a yoga class on Tuesday, found a telephone message from Dr. Shaw. My liver enzymes are no longer elevated; amazing. Although there is yet an audible wheeze when I recline, I feel that I am breathing easier. For the moment my hopes of putting GI issues behind me at a lower dose of LDK 378 (400 mg) have been dashed. Perhaps my body will adjust and episodes will be sporadic. If not, I will deal with it. This is a comparatively easy treatment and so far, effective as well. I finished watching The Tree of Life on Tuesday. My personal review? It reminded me of a meal where the chef has tried too hard; the primary ingredients are fresh and delicious but have been obscured by an excess of culinary flourishes. Less would have been more. And yet I felt the movie concluded on a perfect note; the song of a wood thrush. This entry was posted in LDK 378 and tagged dosing in targeted therapies, LDK 378 and vomiting, liver enzymes and LDK 378, losing weight with lung cancer, rechallenge of LDK 378. Bookmark the permalink. I’m so happy to hear your liver is feeling happy again. Sorry your digestive system isn’t, but I hope you’ll find a way to keep your weight and fluids up. BTW, is it possible it wasn’t the drug giving you that problem? There’s a norovirus (formerly known a Norwalk virus) going around that can make fluids pour out of both ends (vomit + diarrhea). My Dad got so weak from it that he had to be put in the hospital overnight to restore his fluids and electrolytes via IV drip. Fortunately it usually passes in a day or two, but the germs can linger on surfaces for a month and it spreads easily within a household (and the immunity one developes only lasts some months, not years). Craig, Alice’s first response to the ‘situation’ was that perhaps it was the stomach flu. I don’t believe it was though–the headache and chills (not a fever, just feeling chilled) have accompanied my treatment related nausea in the past as well. At 500 mg, I would have nausea or diarrhea about once a week–I am hoping that once I settle into this lesser dose GI disturbances will be more infrequent. I’ve never heard nor seen a wood thrush before. Perhaps because there are no “woods” around here. I do enjoy listening to the various birds as Regal and I take our early morning walks. Sorry to hear about the “throw up”. Hopefully that won’t continue!!!!!! Carolyn, perhaps you should pay a visit to us this summer–and hear a wood thrush in person! It is the most beautiful song in the world. Promise. I was amazed to read your details in the above post. I am also a 5’10” tall woman, weighed 136 at diagnosis 3 years ago, went up to 152 with steroids then fluid retention of crizotinib, now down to 132 this week after the weight loss with LDK 378. I thought perhaps the anorexia and nausea were related to the increased LFTs but mine, like yours, have come back to normal except for still mildly elevated alk phos. The nausea as well as actual abdominal pain/cramping seems totally random. I can not tell what brings it on, have been varying my times of dosage without much improvement. I take Zofran as an antiemetic and really can not tell if it does much of anything. Yesterday I felt miserable and had the abdominal cramping all day. Today, no pain and just got back from lunch out with friends. The 400 mg dosage seems relatively tolerable but I wonder if folks on 300, or larger individuals on 400, have less of the GI problems. I would love to see the data Novartis has but seriously doubt they would share this with patients. Our sharing experiences seems the best way to learn what helps each other. Hope anyone who has suggestions for dealing with the GI issues will offer them. Gene, funny that we have ended up the same size! I do think it’s the LDK. I maintained my weight at 145 (and sometimes a bit higher) for quite a few years prior to this therapy. Of course I lost weight after my lobectomy and chemo, but it came back. I just don’t want to lose more–when I dip below 130 it can become a bit of a downward spiral. With advanced cancer, we have to do our best to not get too thin; wasting is a real problem. I do know one very petite individual on 300 mg and she still has issues with diarrhea. I think, unfortunately, it is just a common side effect of this therapy. I have been taking compazine to no effect, and today my oncologist suggested Zofran for me as well. I’m sorry to hear it doesn’t help with you. One thing, and this is a funny one, that sometimes curbs the nausea is sucking on a lollipop. I have a bag of ‘organic’ pops in the car for that purpose. Maybe give it a try. Your writings are close to the heart…Need not remind you ..I’m certain..of the strength you posess..the gift of being able to share your information and life’s journey with those of us who are akin. You do it with eloquence..and grace, keeping the light hearted touch a part of bringing us close into your space. I too have been listening to our robins…now that they’ve returned…their song brings the gift of Spring. Gwen, thank you and I wish you all those things as well–and the time and peaceful state of mind in which to enjoy them. Hi Linnea- I hope you are feeling better, and glad to hear you are breathing more easily. That is the most important parameter at the moment. I think your current weight gain plan should include the ears of chocolate bunnies (totally cruelty-free, except in concept). Joan, just the ears? I’ll give it a try. Thinking of you too–watched some gorgeous NASA footage from Challenger and pictured my space geek friend Joan watching it as well. I was visiting with the kids on the rainy west coast and just saw this. I guess I had more fun than you’ve been having. Hope the nastiness IS behind now and that what is improving continues to get even better! Sometime remind me to tell you about birds and Berthold. That wood thrush is wonderful. Any plans for Boston? I send you a big hug and if you need a chocoholic companion… Much love! Dear Linnea – I am now back in more “positive” energy and directing as much as I can your way. I am sorry to hear of your difficulties with nausea. Chrystalized ginger can help settle the stomach but it is an acquired taste as not everybody likes it. You have to find a solution before Easter, can’t let all that chocolate go to waste! Dear Linnea I read today that the oldest torch carrier for the upcoming London Olympics is 100 years old. She was asked about her good health and she attributes it to two things – yoga and chocolate. I know you are doing yoga, so now you have to eat as much chocolate as you can! I love reading your post !